Microsoft released another Configuration manager extension tool called Service Extension (Beta) that provides useful information for maintaining a Configuration Manager environment. Download the tool and documentation from Configuration Manager Open Beta community! http://connect.microsoft.com/ConfigurationManagervnext/Downloads/DownloadDetails.aspx?DownloadID=53752. I have just installed this tool (msi) on my client computer which is running configuration manager 2012 R2 Console.After the installation is done,launched the console,can see some new add-ons to the console. Note: The computer where you install this tool need to have internet connection to connect to RSS feeds/technet blogs to provide you the necessary hotfix info,updates etc.If you dont have internet connection,you will not be able to see any information except site versions Updates. If you have installed any cumulative update to the Configmgr 2012 ,there is no way to check its CU level or version directly from Configmgr .you either have to look for admin console Version or look at the registry for CU level but with this service extension tool,it will provide the CU level and version info within the Console. Next, if you click on Site Updates Pane :This shows the updates that are applicable are applicable to a specific release of Configuration Manager. By choosing a release in the Show releases for list, you can filter which updates are shown in this pane to show the updates that are applicable to a specific release. you can see the list of all available hotfix releases for all Configuration manager product releases For Ex: Configmgr 2012 R2,Configmgr 2012 SP1, Configmgr 2012 R2 CU1 etc. The bold letters shows that, I have not marked the article as mark as Read ,If i click on Mark as read for specific article,Bold will changed to normal font to remind you that you have already reviewed this information. Next is Site Versions : This tab gives you the information about Server name ,Site Code ,Site Name ,Base Version and CU Level. 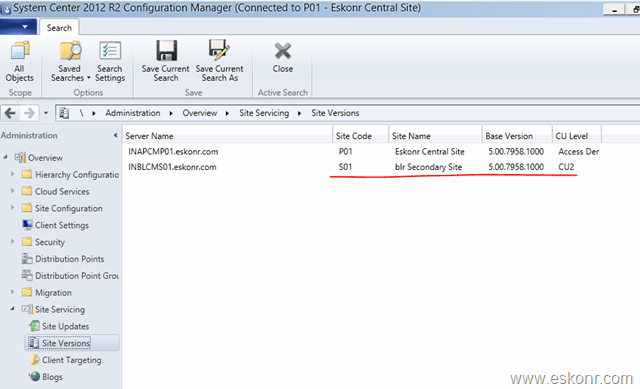 Note: To display the CU level for all sites in your Configuration Manager environment, you must ensure that the Remote Registry service is enabled on both the computer that is running Servicing Extension, and on all other site server computers in your environment (Remote Registry service is enabled by default on Windows Server). Additionally, the user account must the user account must have sufficient privileges to use the Remote Registry service and to read the Configuration Manager registry path on all site server computers in your environment. The Client Targeting pane helps you to create queries that you can use to target client computers in your Configuration Manager environment for updates. You can target clients with a version below a selected release, or with a version at or above a selected release. 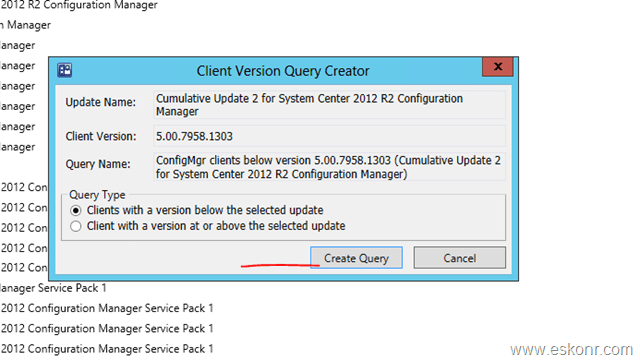 Example: You could create a query to find all clients running a version below System Center 2012 R2 Configuration Manager. You could later use that query to deploy a package that updates those clients to this release. Then you could re-run the query to confirm that all clients were successfully updated. go to monitoring node—>queries ,you will see the query created for and you can import this query while creating collections. 9 Responses to "SCCM Configmgr 2012 Servicing Extension Tool available"
Hi Eswar, I am having similar problems with your link, even though I am logged in with my hotmail/microsoft account. Do you have to be a member of microsoft connect to acces it? the above link is not working could you please provide the correct link. it works fine for me https://connect.microsoft.com/ConfigurationManagervnext/Downloads/DownloadDetails.aspx?DownloadID=53752 .you need to login using your MSN /Hotmail account to download the content. What issues do you have to connect to the link? You can use your msn id to connect. Hold ctrl and select the clients from collection, right click and delete. Or you can also create collection based using wql method if the clients follow specific criteria.